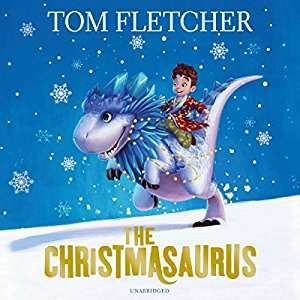 Audible deal of the day - The Christmasaurus by Tom Fletcher. The Christmasaurus is a story about a boy named William Trundle and a dinosaur, the Christmasaurus. It's about how they meet one Christmas Eve and have a magical adventure. True, but you could use your free credit to buy something much more expensive,,, and pay 99p for this. Or could be free with a free 30 day audible trial which you can just cancel after if you prefer. ? Awesome book. Highly recommend this one. Can u link this to an Echo so the Echo reads it? Echo will play any of your audible books. I have never used audible before. How do you listen to this, is it only on audible app or Amazon devices? I would like to get this for my nephew but would either need to be able to put it on mp3 player or preferably burn to cd. I have never used audible before. How do you listen to this, is it only on …I have never used audible before. How do you listen to this, is it only on audible app or Amazon devices? I would like to get this for my nephew but would either need to be able to put it on mp3 player or preferably burn to cd. Audible guide to burning Cd’s - Itunes only.